We often need to print multiple pages of a smaller format on a device that allows a larger format printing. In such case we need to impose (place) these pages on the final imposition sheet. This process called imposition is a typical task for offset printers, which usually work with formats of A2, A1 and larger but is also common in digital print with A3 or A3+ formats. Even in personal use you might need to impose something – for example when we need to print business cards on an A4 sheet we are left with two options. We can either manually copy and paste the card design multiple times in the prepress software or use a tool specifically designed for the task. When we deal with such printing tasks often an application allowing us to print multiple pages on a single sheet becomes a necessity because it makes our work more time efficient, well arranged and also prevents us from making mistakes. The possibility to impose images – JPG, TIF, PSD etc. – is very useful for copyshops as well as for personal use. This way you can easily and quickly print more photos on large format in the size and amount according to your wishes. 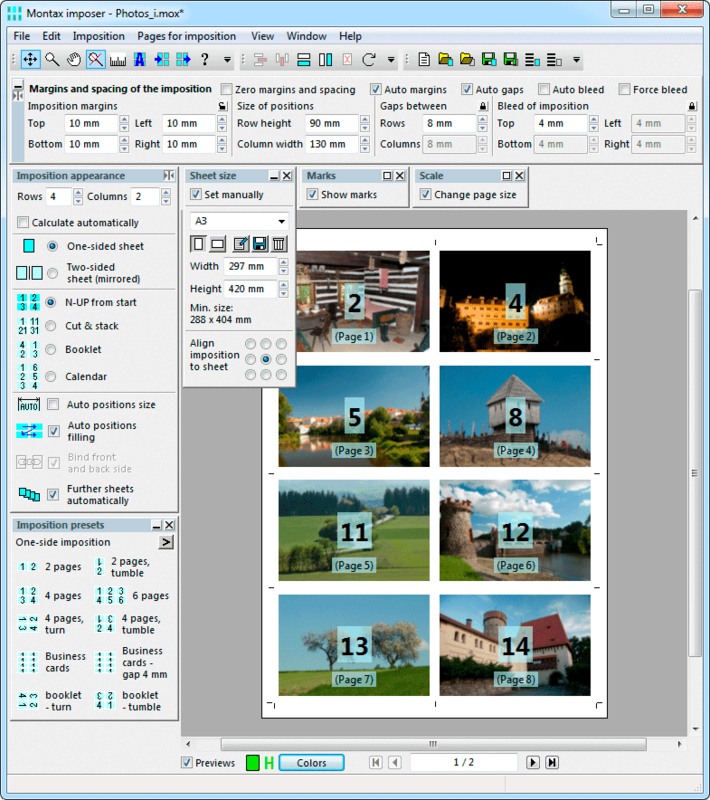 It's a simple way to print multiple images on one sheet. 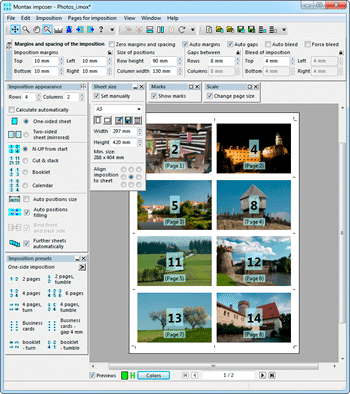 You can use the same tool for printing PDF files and images. Montax Imposer is available as a plug-in for Acrobat or as a standalone application. No other applications are required in the standalone edition! NEW! Montax Imposer includes a tool for correction of digital printer inaccuracies! New Variable Data Printing Extension for Montax Imposer is also available! It is possible to personalize final pdf using data from .csv or .txt file (Excel for example). This version also allows you to create barcodes directly in Montax (for example EAN, QR and much more) and add them to the PDF. You can see an example of using Variable Data Printing Extension. Montax Imposer is a tool designed specifically for imposition allowing you to impose pages and images to pdf on one or more final sheets. It is available for Windows OS (technical requirements) as an standalone application or as an Adobe Acrobat plug-in. Standalone application do not require any third-party application installed for output PDF generation, for preview and print final PDF can be used any PDF viewer. Plug-in requires Adobe Acrobat (in version 6 or higher) to work. Please note that the plug-in is not compatible with Adobe Reader. Our software works with PDF files and images. Using Montax it is very easy to impose them on a sheet and export the resulting sheet to a new PDF file. It is designed for Windows OS. Montax Imposer is available in English, Czech, Slovak, Bulgarian, Spanish, French, Nederlands, Greek, Russian and Italian localizations! If you are interested in the product do not hesitate to try our fully working version of the program called Montax Imposer Free! 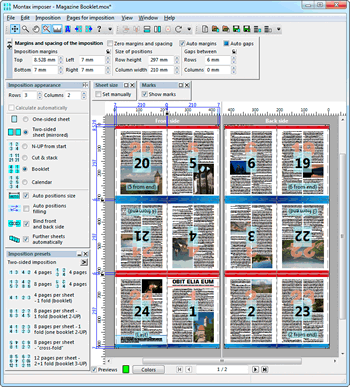 The only restriction of the free version is the final sheet size – all its features are identical to the full version of the program! Other versions of the program including Montax Imposer Basic, Montax Imposer Standard and Montax Imposer Professional are available in the Products page. The version Montax Imposer ProHot support automatic imposition using hotfolders. Montax Imposer has some extra features: Numbering can be added to a sheet (for example ticket numbers, brochure page numbers etc.). It is also possible to add other objects, marks, texts and custom PDFs (for example custom marks or strips). Numbering as well as other custom objects can be moved or resized directly in the work-area. It is possible to use custom objects as a collating marks. Image files (JPG, TIF, PSD, PNG and other types) can also be imposed together with PDF files. Montax Imposer allows the user to impose PDF files very quickly in various ways. Besides the standard N-UP imposition which places pages on the sheet in the order of appearance from the source PDF there are many other options. 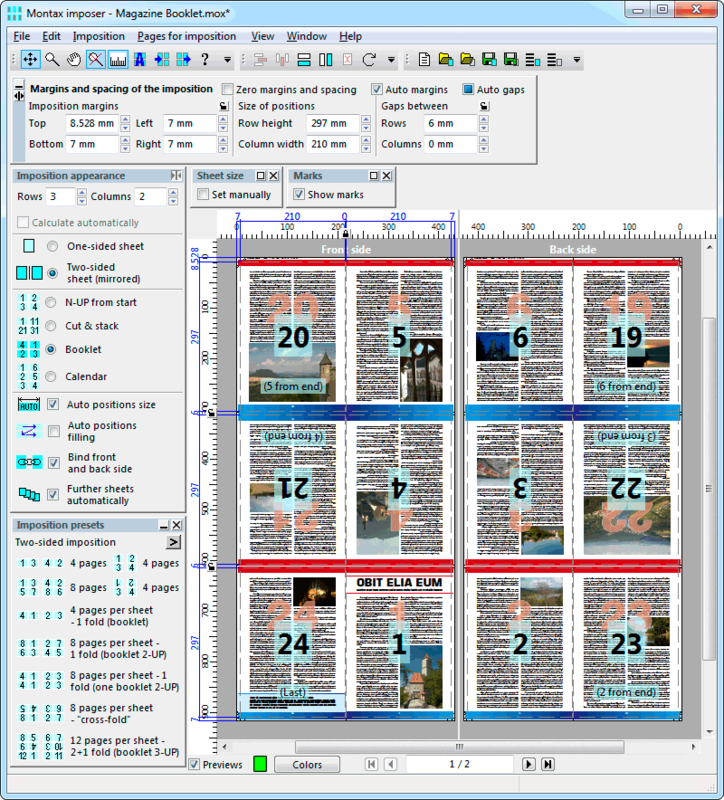 Consider a situation where one needs to impose and print an A5 format publication on an A3 sheet. When this is done without a custom imposition it is necessary to cut the final A3 sheet into A5 pages and then put the pages in the right order by hand. Montax Imposer, however, provides a "Cut & Stack" imposition option where the pages are placed in such a way that after the sheet is cut it is only necessary to place the A5 sheets on top of each other to get the correct order. When printing numbered items, such as entrance tickets, this feature comes in really handy because putting thousands of items in the right order by hand is nearly impossible. Another available imposition style is "Booklet" placing the first and the last page side by side on the sheet, the second and the second to last page on the back of the sheet and so on. The resulting sheet is then folded in the middle and stapled to obtain the booklet. Magazines, newspapers, books and similar printed matters are often imposed like this. There are many options available for this kind of imposition in Montax Imposer, such as cross-fold, double cross-fold, perfect binding and any other complex alternatives, including combinations of these. The imposition type "Calendar" is suitable for table calendars etc. 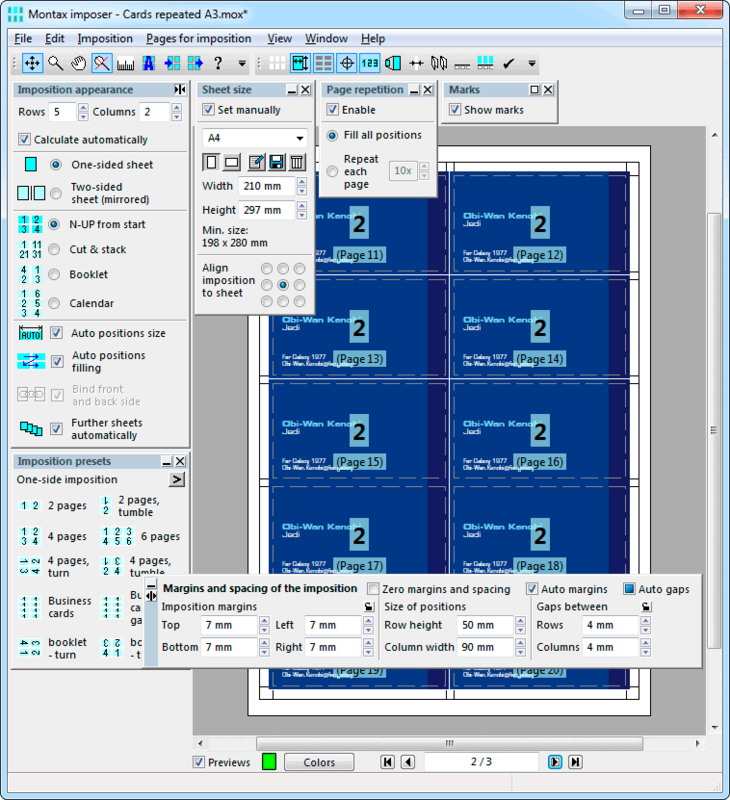 Montax Imposer is very flexible and can be used in many ways. It allows the user to prepare simple, repetitive impositions quickly without the need of saving them as well as complex combinations of different imposing styles. Everyday users will appreciate the simplified automatic mode, where most of the necessary parameters of an imposition are calculated automatically. Of course, all of these parameters can be manually adjusted if it is necessary. To adjust these parameters a set of pallets is introduced in the program sorting the options thematically according to their functions. Many pallets can be switched to an extended mode allowing the user to adjust parameters that are not very common. If you do not need or use some of the functions of Montax, their palettes can easily be closed which makes the program control even easier and the interface simpler. At the same time it assures you that the closed palette will not affect the imposition, because when a palette is closed the features and parameters it controls are deactivated. Montax allows all impositions types - Standard, Cut & Stack, Booklet and Calendar, which can be used in any combination with an option to divide them into groups and use any available binding such as perfect binding, sewing binding, saddle stitching, etc. By combining these impositions and/or adjusting their parameters you can create a vast variety of imposition styles and impose everything you need. Provides an option to load pages from multiple PDF files and impose them into one sheet. Provides an option to add various marks on the sheet including crop marks, registration marks, sheets description, color names, folding marks, etc.